I hope you had a wonderful Easter and enjoyed the beautiful weather from yesterday. All this is of course great for the vineyard, warm temperatures with plenty of sunshine, enough rain to support growth and a little bit of wind on the property to dry things out. We are starting to see some pretty serious shoot growth with the Chardonnay shoots already at 6 inches or so. Not all of the buds have broken yet, Norton and Cabernet Sauvignon have yet to break but with 80 degree days forecasted, I would imagine we will see them break towards the end of the week. As of yet, we have only found one climbing cut worm which is great news and as such I have not even bothered to spray for them which is quite unusual for our vineyard. Talking of spraying though, we have started with a light fungicide spray, all to control Powdery Mildew, Black Rot and Downy Mildew. Our spray regiment is roughly every 10-12 days, alternating different sprays, controlling all the various pests, and diseases that I expect we will see during the course of the growing season. Powdery mildew is a fungal disease that affects a wide range of plants; and are caused by many different species of fungi in the order Erysiphales. It is one of the easier diseases to spot, as its symptoms are quite distinctive. Infected plants display white powdery spots on the leaves and stems. The lower leaves are the most affected, but the mildew can appear on any above-ground part of the plant. As the disease progresses, the spots get larger and denser as large numbers of asexual spores are formed, and the mildew may spread up and down the length of the plant. Downy mildew refers to any of several types of oomycete microbes that are obligate parasites of plants. Downy mildews exclusively belong to Peronosporacae. The most exciting part of this growth stage is that we can already the tiny grape clusters. 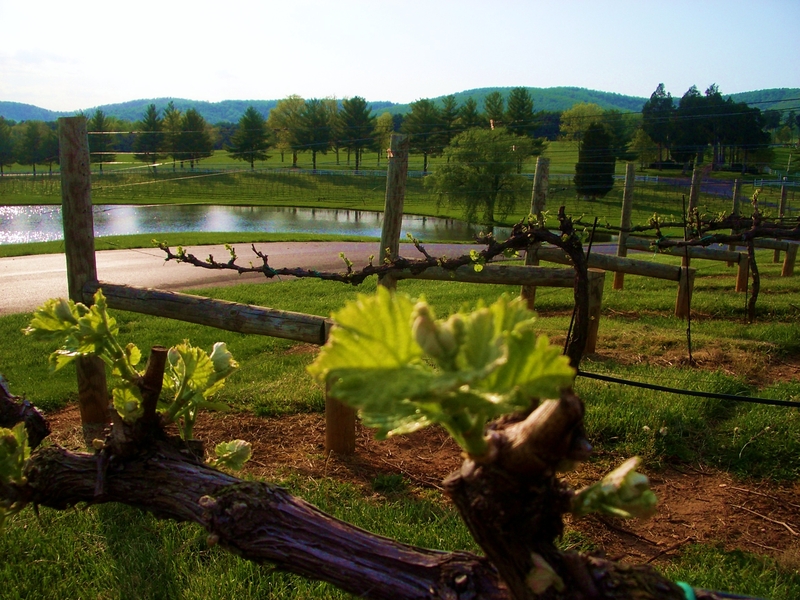 With no immediate threat of frost and all the buds looking fruitful, we are off to a great start in the vineyard, hopefully this spells the start of what will be another fantastic harvest in the state of Virginia. This entry was posted in From the Cellar and tagged budbreak, chardonnay, downy mildew, Norton, powdery mildew.